$4.80 Postage now one low price throughout Australia - for any size order! Half price when purchased with the print edition! 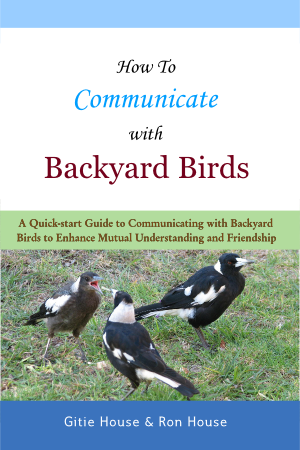 An invaluable quick start guide on how to communicate with backyard birds to enhance mutual understanding and friendship. Over 100 colour images. Take your love for birds much further than just watching and admiring them from a distance. Learn how to communicate with them in your own language and expand your community and connection with these amazing creatures around you. When you put out food and water for your local birds, it might seem like a one-way street; but these are only the means for developing trust and creating a social forum. Once they know you care, they think of you as a member of their extended family, they look out for you, protect you, and go to great lengths within their own communities to incorporate your wishes. It is possible to overcome the communication barrier between ourselves and other species, and your avian friends will share with you all kinds of information about their lives and families. This book explains the communication techniques that the authors have learned from their experiences with their bird friends. Returning customers can log in here to view past orders, downloads etc.